The entrepreneurial competency has been well regarded as the most influential factor in business performance. Despite their being regarded as a vital aspect of business performance, studies of entrepreneurial competencies are still at a preliminary stage. Descriptive research is used to analyze the level of entrepreneurial competencies of students after completing higher education. A comparative study of the Management and Entrepreneurship Programs was undertaken by means of a questionnaire-based survey of final year university students. Statistical analysis was subsequently performed to assess any significant differences in entrepreneurial competencies developed in students by the Management and Entrepreneurship Programs at SBM ITB. The results of the study indicated no significant differences between the entrepreneurial competencies of the two programs. The reported findings contribute to the improving of teaching and learning at SBM ITB. There's broad affirmation that competencies impact the business performance of Small Medium Enterprises (SMEs) (Mitchelmore & Rowley, 2013). Several studies that specialized in Entrepreneurial Competencies (EC) were conducted as a way of supporting SMEs to become successful commercial ventures. Despite ECs being regarded as a vital aspect of business performance, according to Brinckmann (2008) the study of entrepreneurial competencies contained in previous literature was, at that time, still preliminary in nature. Many survey respondents (30%) confirmed that higher education experience was prioritized as an important grounding in business practice (Ernst & Young, 2011). Moreover, the survey of 549 company founders in the United States, 70% said that entrepreneurship education within a university was important in supporting students to become successful entrepreneurs (Wadhwa et al., 2009). Despite higher education making an important contribution to commercial venture success (Ernst & Young, 2011), several countries face constraints relating to both formal and informal education and training, in developing start-ups into established business (Global Entrepreneurship Monitor, 2013-2014). Entrepreneurship Education (EE) has a very important mission in guiding all students towards the developing of an entrepreneurial attitude (Hegarty, 2006). The objective of EE inside a higher education institution is to expose students to entrepreneurial spirit and culture. In alternative words, to produce highly intellectual entrepreneurs and new ventures that may create job opportunities (US Department of Commerce, 2013). Many studies of EE were conducted so as to support students in changing into productive entrepreneurs. However, the tangible results were typically difficult to observe because of the low incidence rate of established business ownership in many countries (Global Entrepreneurship Monitor, 2013). A study conducted by Ghina (2015) provided proof of the effectiveness of EE by means that of a cross-case analysis inside a university context. One potential objective of future analysis remains that of quantifying students’ competencies when having graduated. The assessing of entrepreneurial competencies is often used to ensure the extent to which learning objectives are achieved. For these reasons, it's necessary to measure the entrepreneurial competencies of students from selected previous case studies. The present research compares two programs within an objective study to assess whether graduates demonstrate significant differences in entrepreneurial competence after completing each program. 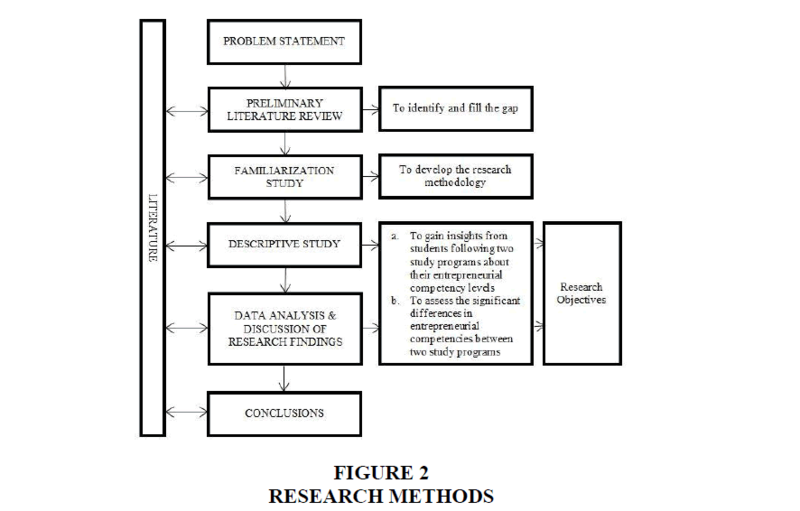 The content of Table 1 represents the formulation of research questions, research objectives and the methods adopted in order to elicit responses to research questions. EC is assuming an increasingly vital role worldwide in promoting success inside both business and also the work. Whereas analysis into entrepreneurial competencies is intensifying and gaining increased legitimacy inside the scientific community, it lacks comprehensive conceptualization, a meaning framework or qualitative measurement tools for SMEs. Thus, it can be aforementioned that the study of competencies in the previous literature on entrepreneurship is in its preliminary stage (Brinckmann, 2008). This is most likely due to the actual fact that almost all studies specialize in quantitative measurement based on previous tools or frameworks. Few studies present any variety of conceptualization of EC, whereas even fewer build on frameworks to elaborate further on this phenomenon. Competence could be a concept possessing several applications (Mitchelmore & Rowley, 2010) generally driven by the goal of achieving increased business performance (Spencer and Spencer, 1993). There are two key terms with reference to competencies: one being individual behavior and the other minimum standards of performance (Strebler et al., 1997). Inside the context of entrepreneurship, competencies are particularly associated with the setting up and sustainability of a commercial enterprise. Analysis shows that the competencies of entrepreneurs contribute to business performance like profitability and growth (Bird, 1995). Entrepreneurial competencies represent a constellation of characteristics related to successful business development. Competencies can vary from personality traits and individual motivations to specific knowledge and skills. Traits and motivations also can spur the development of entrepreneurial competencies that impact on entrepreneurial performance through the mechanisms of venture opportunities, venture strategy and venture growth (Olien & Wetenhall, 2013). There are two synonyms for competencies that have been adopted by many authors, these being “skills” or “expertise”. Moreover, four main classes of competencies exist, namely; human relations competencies, conceptual and relationship competencies, business and management competencies and entrepreneurial competencies. Several authors agree that many competencies are vital for entrepreneurs, like conceptual and analytical skills, the ability to acknowledge and exploit opportunities, management skills, the ability to formulate ways to take advantage of opportunities, customer management skills, decision-making skills, hiring skills, leadership skills, delegation and motivation skills, and commitment (Mitchelmore & Rowley, 2010). Competencies represent acquirable skills that enable people to perform successfully. Therefore, recognizing and identifying competencies is extremely vital for educators and therefore the development of learning opportunities (Mitchelmore & Rowley, 2010). Many conceptualizations of entrepreneurial competencies are developed, however few studies explore the kinds of competencies required by entrepreneurs managing businesses of differing scale. This study specialize in identifying and analysis the differences of students’ entrepreneurial competencies level as the evaluation of learning outcome. The consequences of the entrepreneurial process in this framework are adapted from the EntreComp Framework which defines entrepreneurship as a universal competence applicable to all spheres of life. The EntreComp Framework is made up of three competence-related areas: Ideas and opportunities: spotting opportunities, creativity, vision, valuing ideas, ethical and sustainable thinking, Resources: self-awareness and self-efficacy, motivation and perseverance, mobilizing resources, financial and economic literacy, mobilizing others and Into action: taking the initiative, planning and management, coping with ambiguity, uncertainty, and risk, working with others, learning through experience (Bacigalupo et al., 2016). An entrepreneurial competencies framework can be seen in Figure 1. The unit of analysis incorporated within this research is that of Study Programs. The criteria adopted in identifying the research objectives included: focus on undergraduate level courses in the Bandung area, focus on public institutions, the existence of an institutional vision/mission to create entrepreneurial graduates and, lastly, the institution enjoying broad popularity within the local mass media. The School of Business and Management (SBM), Institut Teknologi Bandung was established on the basis of these criteria. The present research compares two programs within SBM ITB, namely; the Management and Entrepreneurship Programs. These research objects are becoming an increasing priority since, four years after its establishment, the new Entrepreneurship Program requires evaluation of its learning outputs as far as the development of students’ competencies is concerned. The results will be compared to those of the Management Program, as the predecessor to the Study Program, in order to identify any differences in their learning outputs. The learning objective of the Entrepreneurship Study Program is to create educated entrepreneurs, whereas that of the Management Study Program is to produce entrepreneurial graduates who can be educated entrepreneurs or intrapreneurs. The term “entrepreneurs” signifies graduates who subsequently establish their own businesses, whereas “intrapreneurs” denotes graduates possessing an entrepreneurial mindset who are employed by an established company. The sampling strategy adopted to select respondents was one of quotas. The number of respondents from the Management program totaled 193, while that relating to the Entrepreneurship program was 36. The questionnaires concerning Entrepreneurial Competencies were designed along the lines of the EntreComp Framework (Bacigalupo et al., 2016) and incorporated nine Likert scales to measure student perceptions. The sampling strategy applied to the 2014 Entrepreneurship Program batch was one of a quota since it was composed of a single class. Questionnaires were distributed to 36 Entrepreneurship Program students, although only 33 were eligible for further analysis due to many of the items not being completed by the participants. The sampling strategy applied to the Management Program was one of convenience. The questionnaires were distributed to 33 students all of whom were eligible for further analysis. The data relating to the level of students’ competencies gathered by the questionnaires was inputted into a Microsoft Excel 2013 program to be analyzed. Descriptive methods and t-tests were used to analyze the research findings. The EC consists of three variables and thirteen sub-variables, namely; Ideas and opportunities: identifying opportunities, creativity, vision, valuing ideas, ethical and sustainable thinking, Resources: self-awareness and self-efficacy, motivation and perseverance, mobilizing resources, financial and economic literacy and mobilizing others, and Into Action: taking the initiative, planning and management, coping with ambiguity, uncertainty and risk, working with others and learning through experience. The operational variables of spotting opportunities, creativity and valuing ideas are integrated into one variable-creativity and valuing ideas. The research findings of both programs can be seen in Table 2. Management program: All sub-variables are at a high level. The students demonstrate a highly-developed capacity to create and value ideas, while incorporating them into a business plan. They possess good vision and an ability to conceptualize strategy as a means of realizing that vision. Furthermore, they understand the impact of their decisions on the operating environment within which the business strategy is to be implemented. The students understand their strengths and weaknesses and are, consequently, confident in exploiting their business concept. They also ensure that all activities are conducted in accordance with the business plan. The students possess the necessary skills to interpret the market price of products/services. Hence, they are capable of devising a pricing strategy for their products/services and implementing financial budgeting. They also have the capability to manage both financial and non-financial resources such as their co-workers, while also demonstrating a strong initiative in problem solving and a willingness to take calculated risks when implementing their ideas. Crucially, they are capable to cope with ambiguity and uncertainty. The students possess the skills of securing, managing and evaluating their business resources, both financial and human. They are capable of learning from success and failure, thereby introducing necessary improvements and can work as a team, coping with diversity to create new products and services in achieving business goals. Entrepreneurship program: The sub-variables classified as being of a very high level comprise: creativity and valuing ideas, vision, self-awareness and self-efficacy and financial and economic literacy. Students have the knowledge and ability to develop and value good ideas, set certain priorities and incorporate them into a business plan. They also have good vision, the capacity to inspire others and the ability to conceptualize a strategy in order to achieve business goals. The students possess the necessary skills to interpret the market price of products/services, formulate a pricing strategy for their products/services and implement financial budgeting. They are also able to develop a strategy to promote financial sustainability. The students are aware of their strengths and weaknesses, extremely self-confident in exploiting their business ideas and not easily satisfied with their accomplishments. The eight high level sub-variables consist of: ethical and sustainable thinking, motivation and perseverance, mobilizing resources, mobilizing others, taking the initiative, planning and management, coping with ambiguity, uncertainty and risk and, lastly, learning through experience. The students possess both the knowledge and ability to draft a business plan, determine priorities and demonstrate flexibility in adjusting the plan to suit the current environment. They also understand the negative impacts on the environment if they decide to implement the business concept. The students demonstrate the skills of identifying, managing and evaluating their business resources, both human and financial. They are capable of conveying their business idea, encouraging the motivation of others and providing inspiration. They show praiseworthy initiative in taking problem-solving action and calculated high risks in implementing their ideas. They can learn from their own previous experiences as well as those of other people, rendering them capable of further improving skills based on such prior experiences. The students proved highly motivated to make a positive contribution to others, even though they faced several obstacles during the business process, and remained focused on their work in the face of setbacks. There is only one sub-variable of Working with Others which was of an average level. The students believed themselves to be capable of working as a team as long as the diversity of its members was limited. Moreover, they preferred to work as a member, rather than the leader, of a team. This finding was further supported by their response within the questionnaire that they often lose concentration when faced with several challenges. Ho: There are no significant differences in students’ entrepreneurial competencies between the Management Program and the Entrepreneurship Program. Ha: There are significant differences in students’ entrepreneurial competencies between the Management Program and the Entrepreneurship Program. The Independent Samples Test result can be seen in Table 3 (Confidence level=99%). According to the contents of Table 3, if Sig. (2-tailed)<0.01 Ho is rejected, whereas if Sig. (2-tailed) ≥ 0.01, Ho is accepted. The mean scores for students’ competencies in the Management and Entrepreneurship Programs are relatively not equal with regard to the aspects of Vision, Motivation and Perseverance, Financial and Economic Literacy and, lastly, Mobilizing Others. Conversely, the mean scores for students’ competencies in the Entrepreneurship Program are equal with those in the Management Program as far as the aspects of Creativity and Valuing Ideas, Ethical and Sustainable Thinking, Self-Awareness and Self-Efficacy, Mobilizing Resources, Taking the Initiative, Planning and Management, Coping with Ambiguity, Uncertainty and Risk and, finally, Learning through Experience are concerned. In order to develop students’ competencies, both programs are supported by appropriate internal learning processes. The curriculum at an institution consists of multidisciplinary subjects delivered in sequential order each semester. It is aligned to develop desired competencies through a systematic process. In fact, extant literature has suggested that entrepreneurial learning is the main vehicle for competency development (Markowska, 2011). The institution consistently uses experiential learning as the main method of delivering course materials across all semesters. It also provides an entrepreneurship center, external/internal funding for start-ups, competitions, community service opportunities, guest lectures and a business incubator. In fact, according to the existing literature, such practice is highly appropriate. There is a consensus among scholars that developing entrepreneurial skills is achieved through direct experiences (Lackéus, 2013). According to the contents of Table 1, only four aspects are significantly different in both programs, while the remaining ones are equal. These findings are due to the similarity in the curricula of both programs and their learning outcomes with regard to most aspects of entrepreneurial competencies. They will challenge Entrepreneurship as a new program to explore more stringently its value proposition compared to that of the Management program as a longer-established study program. Within the category of Working with Others, the mean scores for students’ competencies in the Management Program are higher than those of the Entrepreneurship Program. The students of the Management Program are establishing and running businesses based on large working groups, whereas the Entrepreneurship Program students are allowed to set up and run individual businesses. This situation could influence the manner in which students cope with conflict within a diversity environment. A lack of teamwork competencies leads to an ineffective learning process. More specifically, the findings highlight students’ inability to work effectively where considerable diversity as far as personal characters and ideas are concerned exists. Within a business context, this weakness could inhibit business performance considering the increasingly dynamic and multicultural environment likely to prevail in the future. Teamwork is one pillar of business sustainability in a dynamic commercial environment which can respond rapidly to decisions as an implementation of organic organization influenced by leadership (Gustomo et al., 2011). Effective teamwork has several characteristics such as: collaborating to achieve the company's objectives, being dependent upon and trusting in each other and making decisions based on mutual agreement (Senior & Swailes, 2004). Diversity in teamwork is capable of providing dynamic new ideas which, if managed properly, can enhance business opportunities (Gutmann, 2005). Therefore, the ability to work in teams must form part of the learning goals underpinning the development of entrepreneurial competence. a) The institution should evaluate the curricula of both programs since certain aspects of knowledge regarding the ability to create and value ideas, set a vision, and demonstrate ethical and sustainable thinking are relatively equal in importance. b) The value of the curriculum of the Entrepreneurship Program in creating educated entrepreneurs should be further explored in order to identify any significant differences with the Management Program across all aspects of competencies. c) Ultimately, students should be guided towards becoming creativepreneurs/digitalpreneurs/biotechpreneurs in collaboration with other faculties within ITB as a means of their having greater impact on social and economic development. This learning objective could be achieved if the institution provides Creative Industry, Information and Communication Technology, and Biotechnology courses within the curriculum. The foregoing research findings provide insights for both academics and practitioners within a university context into the key entrepreneurial competencies necessary for developing entrepreneurial graduates. Moreover, the implications for practitioners include monitoring the curriculum as a means of managing learning to effectively realize institutional goals. Such monitoring may identify learning improvement opportunities within the university, including different aspects for students, lecturers and the institution (Ghina & Gustomo, 2017). This finding is supported by the previous literature which asserts that higher education managers should identify, monitor and evaluate key stakeholder roles, while promoting improvements to make learning effective. Naturally, further research could be conducted as explanatory studies through cross-case analysis. Annually-conducted longitudinal studies may also be needed in order to evaluate learning effectiveness by identifying the entrepreneurial competencies of university graduates as either entrepreneurs or intrapreneurs. Bacigalupo, M., Kampylis, P., Punie, Y., & Van den Brande, G. (2016). 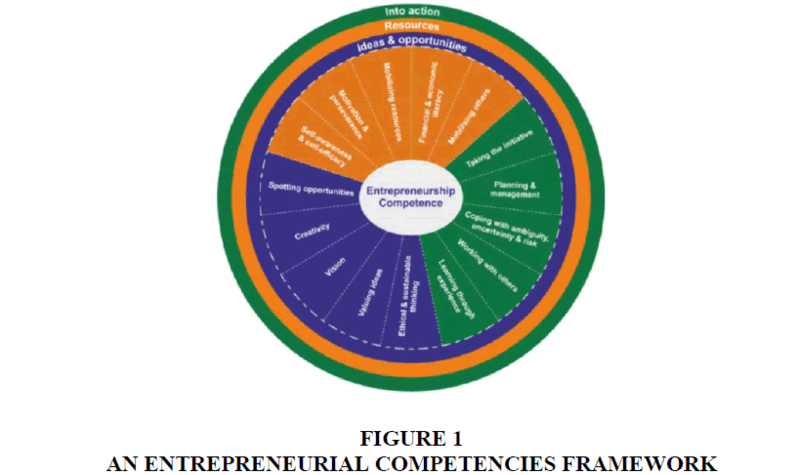 EntreComp: The entrepreneurship competence framework. Luxembourg: Publication Office of the European Union. Brinckmann, J. (2008). Competence of top management teams and success of new technology-based firms: A theoretical and empirical analysis concerning competencies of entrepreneurial teams and the development of their ventures. Germany: Deutscher Universitäts-Verlag. Bird, B. (1995). Towards a theory of entrepreneurial competency: Advances in entrepreneurship. Firm Emergence and Growth, 2, 51-72. Ernst., & Young. (2011). Nature or nurture? Decoding the DNA of the entrepreneur. EYGM Limited. Ghina, A (2015). The effectiveness of entrepreneurship education in developing entrepreneurial graduates within a university context. Unpublished Dissertation. Bandung: Institut Teknologi Bandung. Ghina, A., & Gustomo, A. (2017). The relevancy of graduates’ competencies to the effectiveness of entrepreneurship education: A case study at SBM ITB–Indonesia. Journal of Entrepreneurship Education, 20(1), 12-35. Global Entrepreneurship Monitor. (2013). Entrepreneurial behaviour and attitudes. Global Entrepreneurship Monitor. (2013-2014). Country profile. Gustomo, A., Hutagaol, M.P., Mangkuprawira, S., & Putro, U.S. (2011). The modeling of the influence of collaborative leadership and corporate culture towards team performance: Case study on PT Jasa Marga. The 1st International Business Management Research Conference (IBMRC).Thailand: Le Meridien Hotel. Gutmann, H. (2005). Partnering to solve team problems. John Wiley & Sons. Hegarty, C. (2006). It’s not an exact science: Teaching entrepreneurship in Northern Ireland. Journal of Education+Training, 48(5), 321-322. Lackéus, M. (2013). Developing entrepreneurial competencies: An action-based approach and classification in entrepreneurial education. Sweden: Chalmers University of Technology. Markowska, M. (2011). Entrepreneurial competence development: Triggers, processes, and consequences. Unpublished Dissertation. Jönköping International Business School Jönköping University, 28-40. Olien, J., & Wetenhall, P. (2013). Entrepreneurial competency. Ventureprise, Inc., 1-12. Senior, B., & Swailes, S. (2004). The dimension of management team performance: A repertory grid study. International Journal of Productivity and Performance Management, 53, 317-333. Spencer, L., & Spencer, S. (1993). Competence at work: Model for superior performance. New York: John Wiley & Sons. Strebler, M., Robinson, D., & Heron, P. (1997). Getting the best out of your competencies. Brighton: Institute of Employment Studies, University of Sussex. US Department of Commerce. (2013). The innovative and entrepreneurial university: Higher education, innovation and entrepreneurship in focus. Office of Innovation and Entrepreneurship, Economic Development Administration, 18-20. Wadhwa, V., Aggarwal, L., Holly, K.Z., & Salkever, A. (2009). The anatomy of an entrepreneur: Making of a successful entrepreneur. Kauffman: The Foundation of Entrepreneurship.